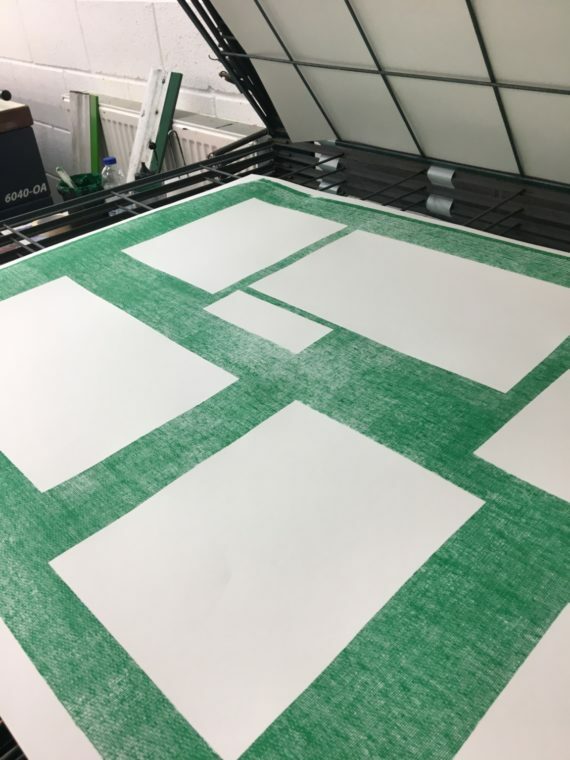 2018 A-N artist bursary blog documenting the research and development of new works by Euphrosyne Andrews. 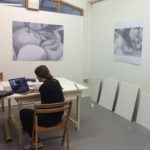 Supported by a-n artist bursaries and using public funding from Arts Council England, I have been developing a body of work exhibited as part of Plymouth Art Weekender 2018, under the mentorship of Plymouth based curator Lucy Rollins. 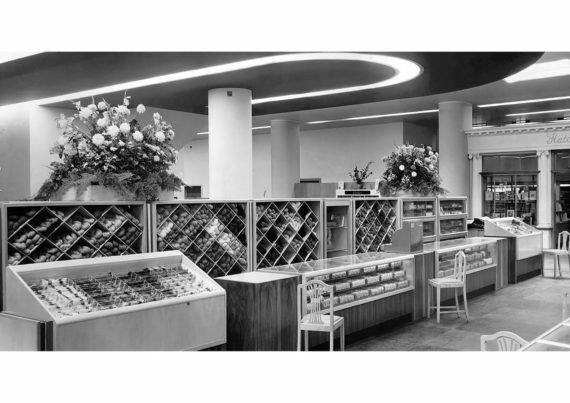 Referencing the current retail decline in Plymouth the project looks to the history of the department store as a case study in the relationship of fine and applied arts. The works explore ideas around the artwork as product, the viewer as consumer and the mass produced item as an object with bespoke value. The term third place describes a neutral space separate from the two predominant surroundings of the home (first place) and work (second place). 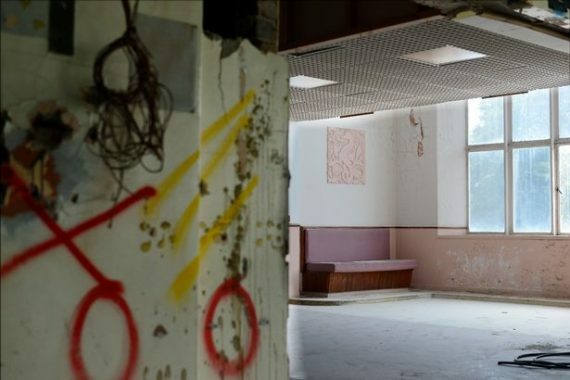 Described by American sociologist Ray Oldenburg in his writing ‘The Great Good Place’, the third place exists as a social space without the constraints of the home or work environment, crucial to our public life and interaction within communities. 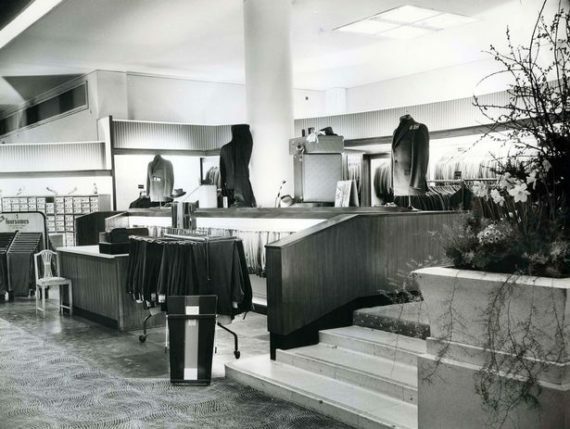 Focusing on the history of the department store in Plymouth not only as an example of a third space within our society, but as a case study in the relationship of fine/applied arts – the following images are taken from the archive at Plymouth Museum, looking into the archetypal interior of the original retail space. Existing throughout its history in an array of forms, the retail space embodies the idea of the third place, as a place of congregation and social interaction. 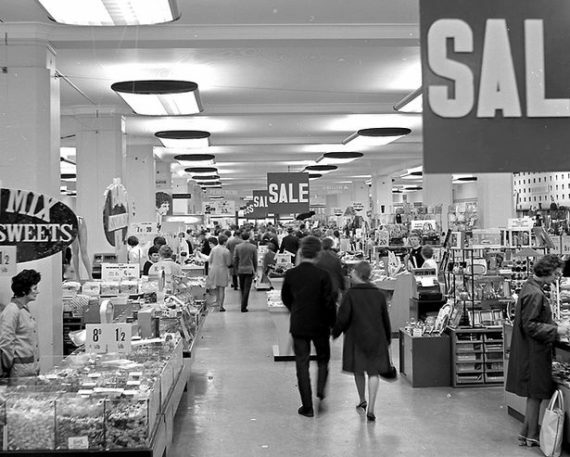 Referencing the current retail decline in Plymouth, the role of the department store in today’s high street has undergone significant change. With the original model of the department store offering a distinct shopping experience either through use of space, retail display or product engagement, our consumer relationship has shifted, instigating a conversation about the future of the retail space at a time when physical spaces are transitioning to an online platform. 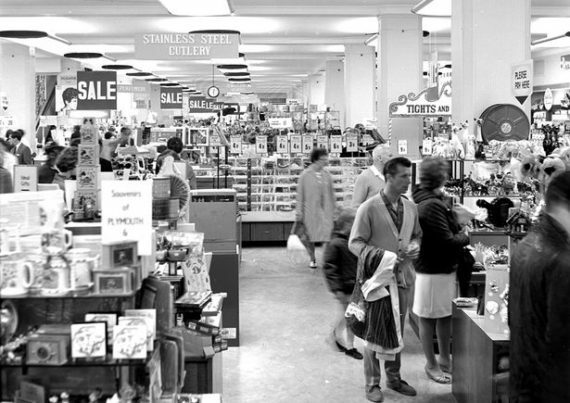 Mass produced goods populate the modern day department store removing our physical connection with products. Items are often viewed remotely; documented and presented as if an artwork within the context of the gallery space. Online shopping has removed the experience aspect of our consumer relationship, presenting a user experience that is more time and cost effective. 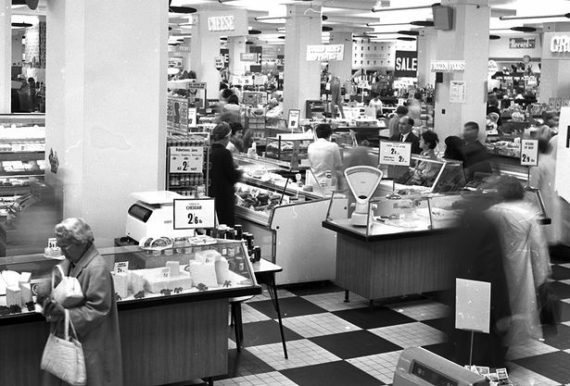 Loosing sight of the original values that saw the department store as a destination and shopping as a leisure activity, today’s retail experiences are all facing the same problem. How to respond to a fundamental change in our consumer behaviour, and compete with an online platform? 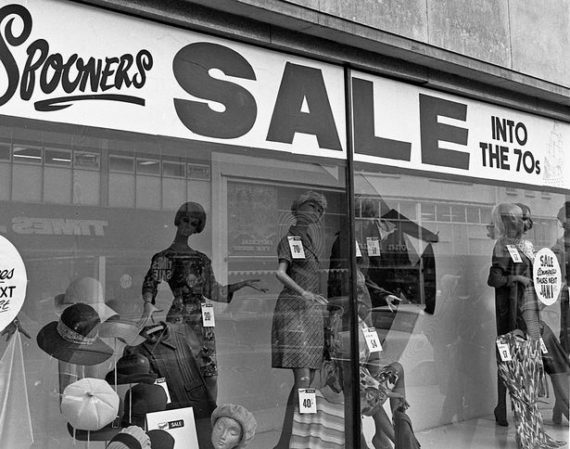 Over the past decade Plymouth has lost long term stores such as Woolworths, British Home Stores and Derrys Department Store. 2018 sees the added closure of House of Fraser as well as a potential loss of Marks and Spencer in the city centre. 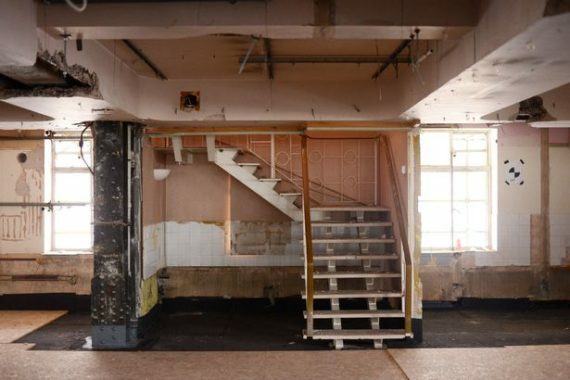 Inside the former building of Derrys department store, currently undergoing redevelopment to be transformed into student accommodation and an accompanying hotel. Images Penny Cross 2017. The uncertain relationship between the fine and applied arts is considered in the original model of the department store. Unique artworks and commissions displayed alongside mass produced commercial and domestic goods, and an importance given to the spatial design and curation of products. The following body of work explores this relationship, referencing ideas around the artwork as product, the viewer as consumer and the mass produced item as an object with bespoke value. Drawing parallels between the gallery and the retail environment, the installation reflects the notion of the showroom as a space in which products are displayed and curated. 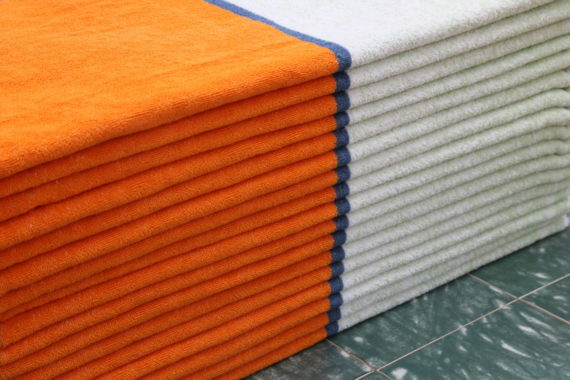 Artworks reflect commonplace consumer items in their presentation, fabricated through methods that are associated with commercial mass production. 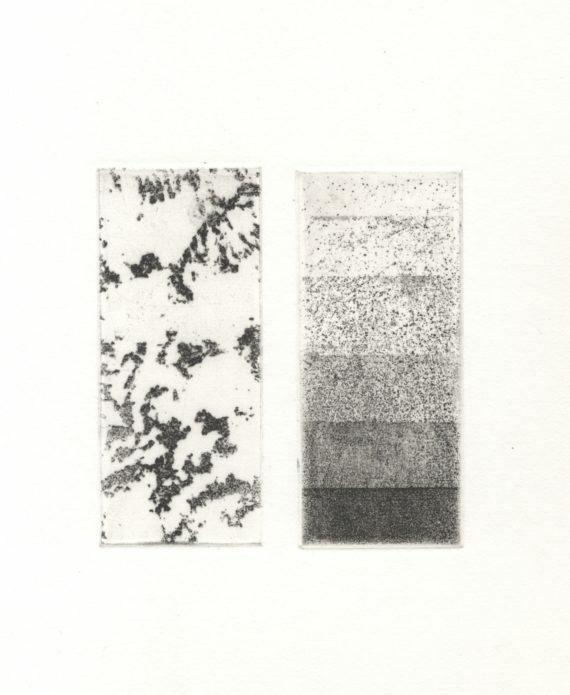 Using the gradient as a process required in any medium to reproduce or create an image, the developed artworks act as samples to demonstrate the unique characteristics and possibilities that can be achieved through different mediums. 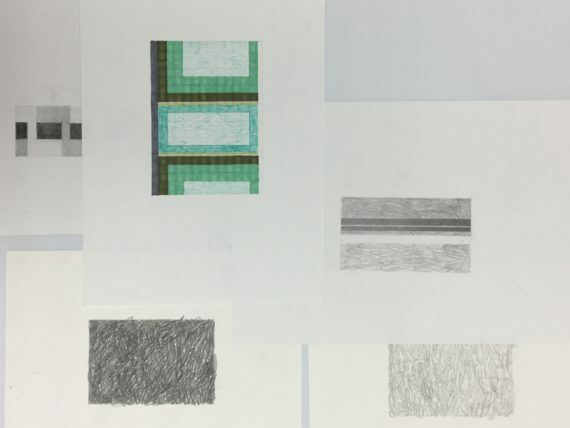 Using the notion of the test strip, the following works in progress are a catalogue of technical possibilities that can be achieved through each different medium. Working with original etchings and drawings, the works exploit the idea of the multiple, commonly associated with the decorative arts in relation to motifs and patterns, reproduced around the world. 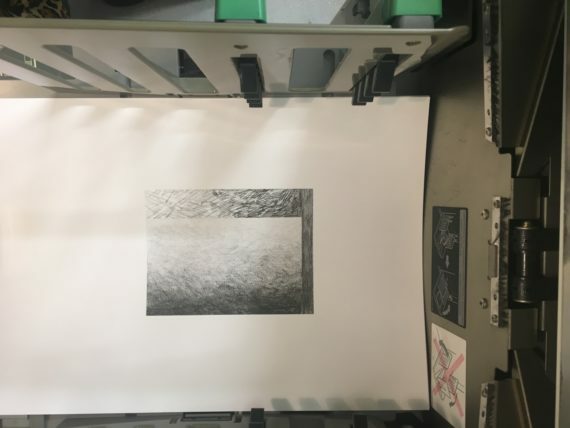 Translating etchings into works that reflect commonplace consumer items in their presentation, through methods associated with commercial mass production. Subverting the established position of etching within the fine arts, these works encapsulate the essence of applied arts, producing a functional artwork. 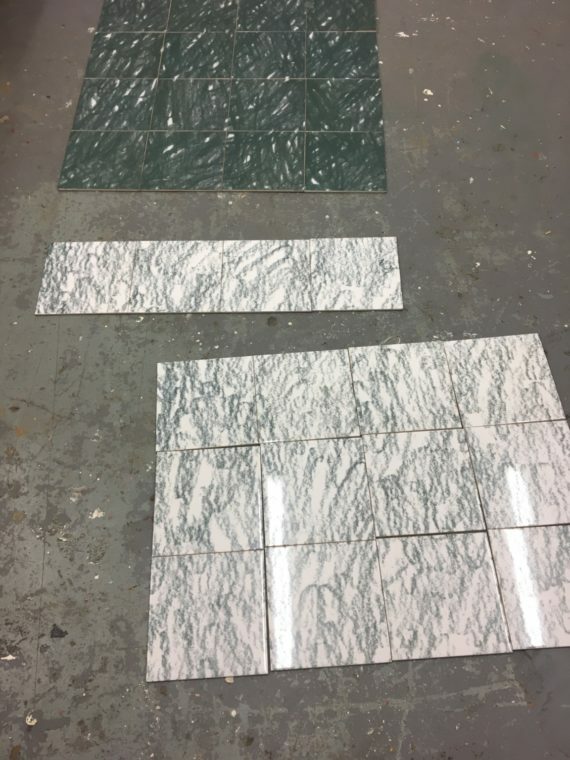 Aluminium test plates using stop out varnish. Catalogue of dry point tools on copper. Digitally printed ceramic tiles. 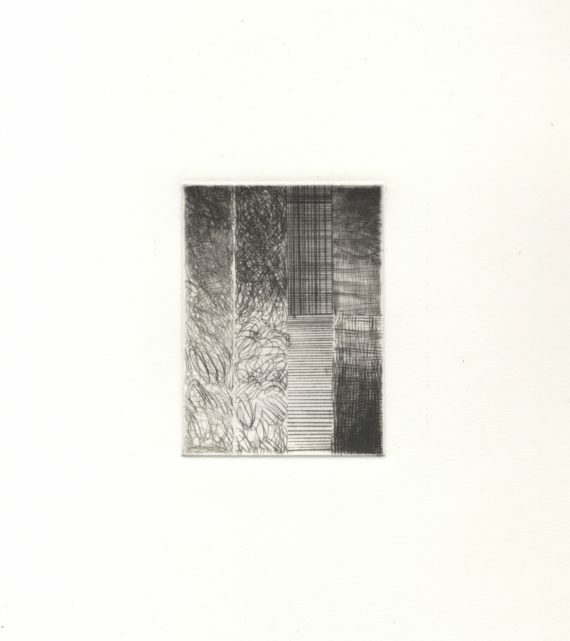 “SHADE” collection from original pencil drawings. Drawing plans and proposals for works. Risograph reproduction of pencil drawing. 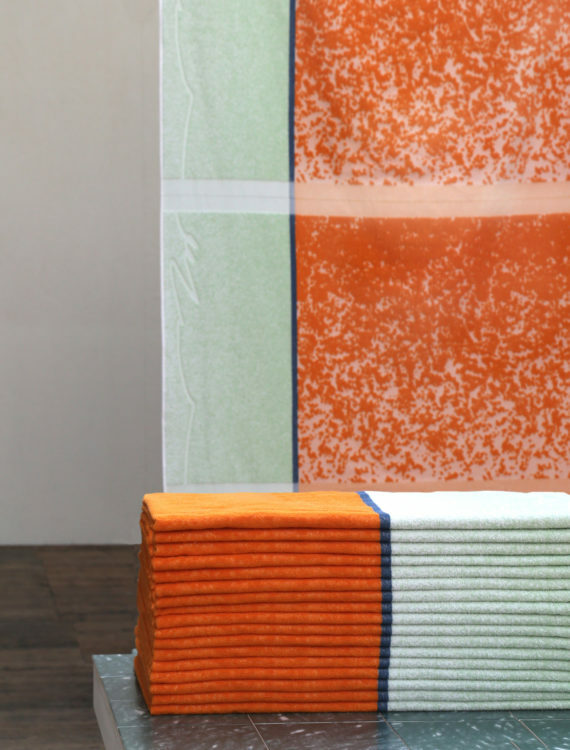 Original etchings translated through the process of jacquard weaving, a method of mass production, to produce an edition of 100 functional towels. Each signed as if an printed edition, and numbered with a hand embroidered patch. 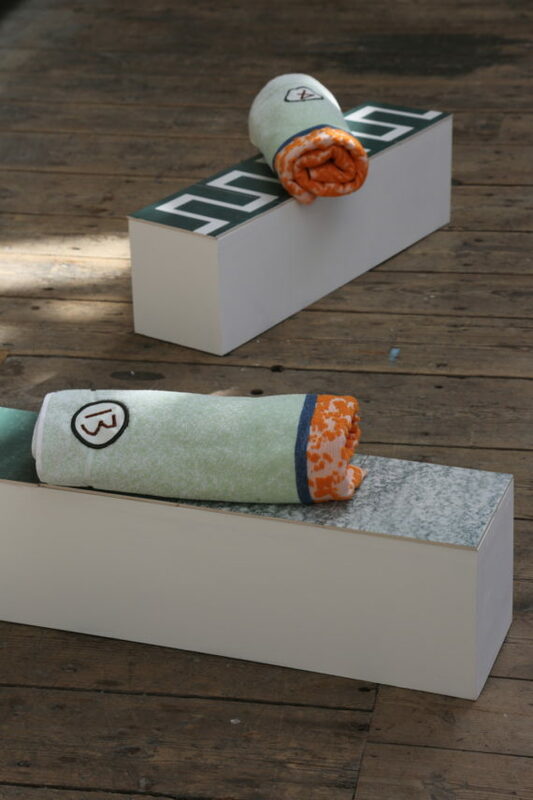 Each towel acts as a sampler, cataloguing the varying effects possible with the jacquard weaving process. The curation of the works draws reference to the history of retail display, and the values of the department store in regard to fine and applied arts. 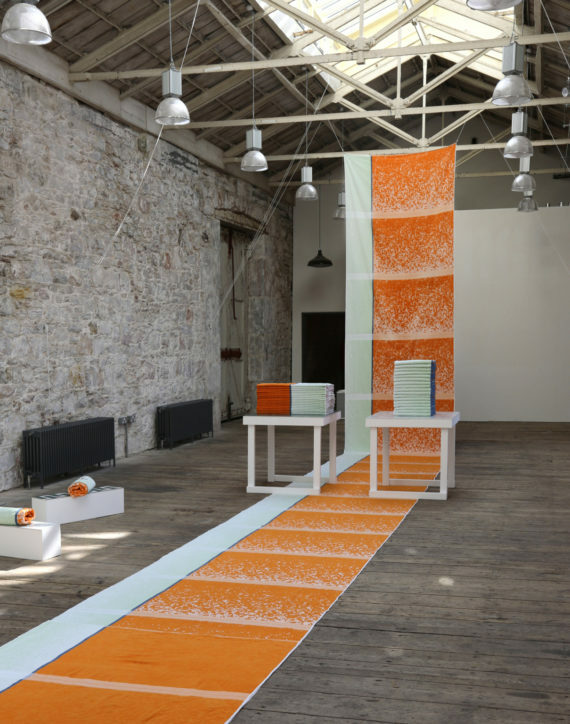 Euphrosyne Andrews is an artist based in London, working predominantly with installation. Bringing to bear ideas of the applied arts, her work places importance on public spaces and their role in the integration and development of communities. The work is specifically drawn to links between the history of decorative arts and politics, architecture and social behaviour.